Today I am proud to announce that I am making progress in the fitting of my garments. Or at least I think I do. 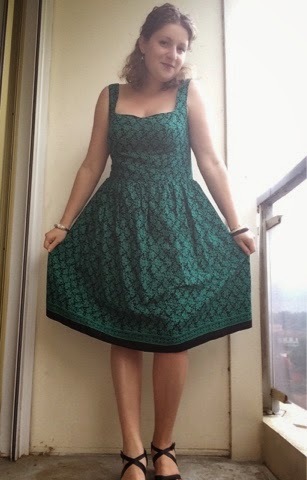 Case in point, look at this Kim dress! I feel happy every time I wear it! To understand this happiness, we need to talk about my body. It’s incredible how far I have come to know my body shape and size, and to accept it the way it is. Anyway, I still feel a bit ashamed to state that my waist measurement falls in a bigger size than my chest does. There! I’ve said it. My belly: the feature I have been constantly trying to hide for the last 8 years or so. Large and long tops and so on were my best friends. Not any more. 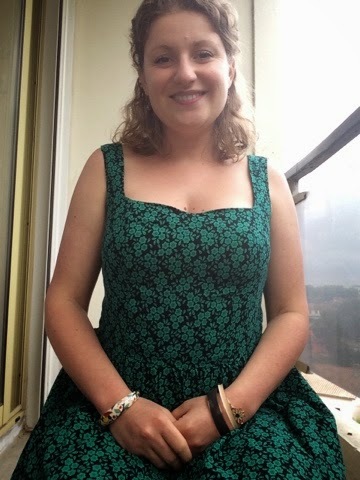 Thanks to sewing I have learned that I can wear a dress with a well defined waist and a hugging bodice, and still feel pretty and happy in it. Of course this acknowledgement has not been immediate since the first time I have sewn something. 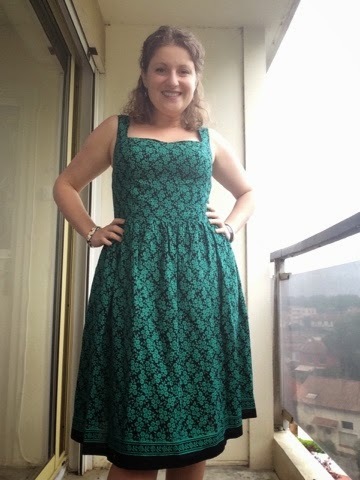 For what concerns my experience with By Hand London patterns, I had sewn two Flora dresses, and their size was chosen accordingly to my waist measurement (size 14/18). Wrong!!! In fact, I ended up with shoulder straps longer than necessary, and wrinkles in the underarm, because of the extra room that was not occupied by my ladies. 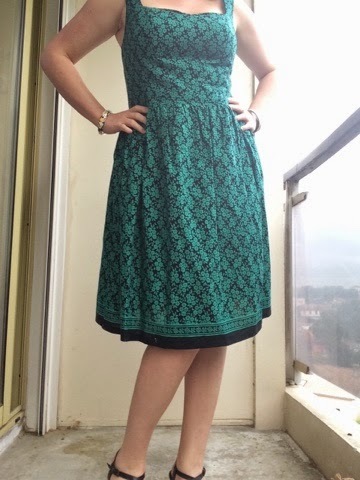 Since the release of the Kim dress, I have struggled pas mal whether to buy it or not, the main reason being the work I had to do to fit it to my body. Then the girls at BHL announced that they were not printing patterns any more, and I decided I wanted this one. You know what? I am so glad I did! (But sad for the announcement). This time I used the bust measurement to choose my size (size 12/16), and then proceeded to a 6 cm FBA to accommodate my ladies’ fullness: my full bust and upper bust have 10 cm difference. Also, at the end of the FBA you are supposed to reduce the extra width you add at the waist; I didn’t, and so I had room for my waist. That’s it! I truly don’t know how orthodox this is, but it worked for me. To be honest, I had a little too much room all over the bodice. I don’t know where I was wrong, but I used a larger seam allowance and it worked just fine. I mean, look at the bodice! Last construction trick: I don’t like to wear full gathered skirts because you know, I have fullness enough around my waist, no need to add more to feel curvy. So I gathered a much much smaller rectangle than suggested, and I am happy with the result. 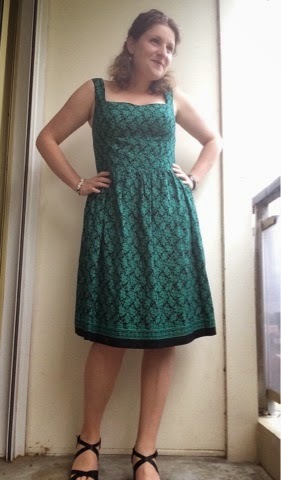 I enjoy a gathered skirt, and this, my friends, has never happened before! Now let’s talk about this magnificent fabric: a soft cotton gauze coming from an Indian shop I might visit soon again here in Toulouse. The guy has decided to not import fabric any more because it doesn’t sell well enough, and so he’s having a huge sale on it!. I had 2,5 m for 14€. I like how soft it is, and its drape, and the price, and the fact that the guy forced me to buy more than I asked for because it was the end of the bolt, and so I had fabric enough to use as a self lining for the bodice. Also, border print guys! You know I can not resist it! I don’t know what I was doing in the picture before, but I am sharing it anyway. I can go on and on about how beautiful this dress is and how pretty it makes me feel, with the cute sweetheart detail and the simple vaporous skirt. But I won’t go on and on because I have annoyed you enough with the technical details and the description of my body. Enough for today. (And you will see another Kim soon). Just one last picture, of a very happy me. 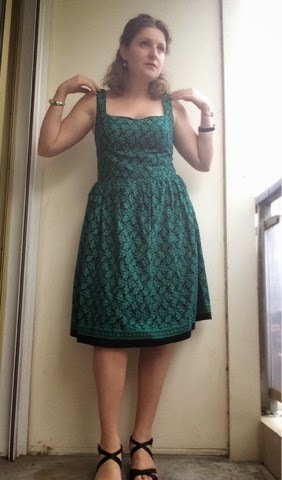 Look ma: I am wearing a fitted bodice!